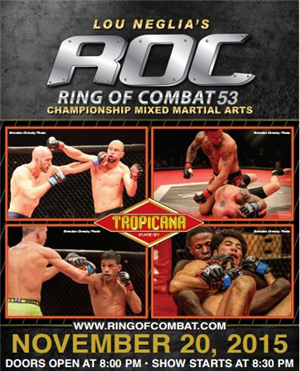 The MMA Journalist: Dana White Is Coming to ROC 53 - Who Will Impress Him? Julio Arce - Up until his last fight at ROC 52, Arce was undefeated and on track for a UFC slot like nobody else. Unfortunately, the Tiger Schulmann-trained fighter lost a majority decision to the veteran Brian Kelleher, so now it's time for this now-former ROC champ to redeem himself AND impress. He's dangerous on the ground and like a surgeon with his striking on the feet, so unless opponent Josh Robinson has the performance of a lifetime, Arce should do well. Max Bohanan - Fighting like a submission wizard on meth, Bohanan is an undefeated disciple of Ricardo Almeida with a penchant for putting away foes rather quickly. For example, his fight ROC 52 resulted in a tap out in just 53 seconds - that's fast. If Bohanan simply does what he normally does, he's going to impress. Sean Santella - Santella has been one of the best "little guys" in the Northeast for years, and has won numerous belts in ROC and the Cage Fury Fighting Championships. But the clock is ticking and Santella isn't getting younger, so it may be now or never if he's going to make the jump to the big stage. Despite coming off of two decision losses, he's got the requisite skills, experience and ability. He just has to fire on all cylinders when it's race time. Brad Desir - He's got some wins and he's got some losses on his record, but this much is true about Desir: He can throw hard leather, he can nail subs, and he can be explosive when he needs to be. All of that is a recipe for something exciting, and "something exciting" in front of White is really all it takes. Randy Brown - Since turning pro back in 2014, Brown has become quite the finisher (via both submissions and TKOs), and everyone loves finishers. Along with Arce and Bohanan, Brown is one of the fighters on the ROC 53 card who will likely make White stand up in his seat and yell out profanity - and that's a good thing. Kenny Rivera - It's been almost two years since Rivera last fought, but his last outing did result in a 24-second win via guillotine, so maybe ring rust will be a factor and maybe it won't. Regardless, Rivera's got hella experience, and when he's on point, he's fantastic. Gregy Styles - I have to add Styles to this list because he's an ace at smashing dudes. Never mind that he's only had one pro fight - as an amateur in New York and New Jersey, he's been in wars and he's wrecked opponents, invariably bouncing their heads off the canvas with great violence. Like Santella, Styles is getting long in the tooth, but he's got that "Boom! It's all over!" quality about him when he fights, and that could pay dividends when the spotlight is on him.